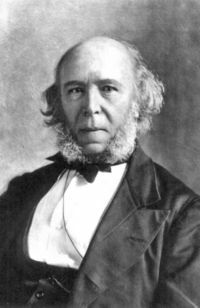 When, fourteen years after its first appearance in 1850 an American edition of Herbert Spencer's Social Statics was released, its author wrote a preface in which he made clear that the book was but a "rough sketch" and that since its publication his views had altered, not least in thinking that the discussion of the bases of morality was merely, "a moiety of the ground work on which a scientific system of Ethics must rest." Social Statics is, on the one hand, an attempt to assert that ethics, just like physics, is matter of law, of necessity, and on the other a sensitive, insightful and high-minded discussion of the major social issues of the time. That there is little connection between the former and the latter militates against Spencer's thesis. His discussion of the rights of women, democracy, the role of the State, the rights of children, relations between classes owes nothing to his conviction that ethics is a science. It owes much, however, to religion.
" ... every man may claim the fullest liberty to exercise his faculties compatible with the possession of like liberty by every other man." Spencer is no timid moralist. He believes in freedom and views whatever stands in its way as evil. He will have no truck with "expediency" which claims that a denial or restriction of freedom is necessary for the efficiency of the economy or social peace. On the contrary, Spencer can see no purpose in efficiency or social harmony other than the enhancement of freedom. He is a true champion of the individual against the institution and will accept no sophistry that leads to a diminution of individual freedom, whatever supposed benefit it may serve. He is, apparently, the enemy of those twin forms of oppression which dominate the modern world: big business on the one hand, the State on the other. That the individual should be subsumed to either is anathema. He is convinced, also, that only individuals who view their freedom as precious can respect the freedom of others. Slavery and tyranny are different sides of the same coin. Freedom is the rejection of both tyranny and slavery. A free man never commands, he requests. Free women do not obey, they cooperate. The freedom of each is the freedom of all in a world founded an equality and co-operation. "... as surely as a disregarded conscience becomes inert and one that is obeyed active; as surely as there is any efficacy in educational culture or any meaning in such terms as habit, custom, practice; so surely must the human faculties be moulded into complete fitness for the social state; so surely must the things we call evil and immorality disappear; so surely must man become perfect." "All evil results from the non-adaptation of constitution to conditions." "... from an impulse to behave in the way we call equitable, there will arise a perception that such behaviour is proper... This instinct or sentiment, being gratified by a just action and distressed by an unjust action, produces in us an approbation of the one and a disgust towards the other." He agrees with the Adam Smith of The Theory Of Moral Sentiments in postulating a faculty of "Sympathy" which ensures that the "instinct" to defend personal rights is extended to the defence of the rights of others. Yet, if we are, on the one hand endowed with a faculty of innate moral discrimination which requires no conscious reflection but works as an instinct, and on the other with an innate recognition of the rights of others, why, as Spencer willingly admits, is there so much evil, or as he puts it, 'imperfection' in the world? In Spencer's view this can only be because we have not yet brought our social arrangements into harmony with our innate impulses, that there is a mismatch between constitution and conditions. But the puzzle remains, for how can our conditions be less than perfect when we are endowed by nature for perfection? Why would human beings granted by God a set of automatic moral responses and an equally infallible sense of the rights of others establish those very tyrannies and injustices which Spencer sets out to expose? How could it be, for example, that endowed with an innate and reliable sense of the rights of others, women could have been treated as inferior for centuries and blacks reduced to the level of the subhuman? How, likewise, could slavery have been established if we cannot fail to recognise the right of others to be treated as we would wish ourselves to be treated, for who would willingly wish to be whipped, driven, starved and even executed on the whim of a tyrant? If human nature is made for perfection how have we created such imperfect conditions? It is inadequate to argue that the conditions have not been created but given and that mankind must be patient as social evolution shall ensure that they develop to meet our innate perfection, for the evil that flows from the incongruity between constitution and conditions prevents the very evolution which is supposed, progressively and inevitably, to close the gap. Spencer's assertion that "evil perpetually tends to disappear" is gainsaid by the facts of history. Even a cursory survey of the history of the West over the past two thousand years makes it impossible to cite historical evidence in defence of a theory of "the evanescence of evil", the notion that with the passage of time humankind becomes inevitably less brutal and selfish. Simply to cite the names of Hitler and Stalin is to evoke the enormity of evil in the twentieth century. The historical record argues much more in favour of the persistence of evil than for its evanescence. In distinguishing between constitution and conditions Spencer fails to acknowledge that, in human life, the latter are a product of the former. He reduces human life to the level of the organic, the physiological. There is no difference between the adaptation of a plant to its soil and the adaptation of human beings to their society. Yet the soil in which the plant grows is not its own creation. If the plant fails to flourish, the soil remains. Society, however, is not a given medium in which we either blossom or perish, it is a creation of our actions, and if we wither, society withers too. The strength and reality of our feelings and ideas and the actions which flow from them determine the nature of the conditions in which we live. Unlike a plant or an animal we are not at one with nature, we are not presented with ready-made conditions to which we simply have to adapt in order to prosper; rather, we must create the conditions of our own life out of our choices. This is what is meant by freedom. If, like a plant, we are subject to law, to necessity, then there can be neither good nor evil in our lives. When Spencer compares the failure of a plant to human evil he is making a fundamental mistake: nothing in nature is evil, not the death of a plant nor the eruption of a volcano nor the implosion of a star. Nature is the arena of necessity and whatever is a matter of necessity is beyond value. Value judgements, questions of right or wrong, good or evil, the noble versus the ignoble, apply only to whatever is the outcome of conscious intention. Only actions can be good or evil. The evil of our conditions of life is of our own making, its imperfection, however may not be. Supposing a population facing drought and famine because of extreme weather conditions. This is clearly an imperfection but not necessarily evil. If no help were brought to these people by others from more fortunate regions and as a result deaths were to ensue, that would be evil. But a remote people, cut off from all human contact which perished because of natural disaster would be the victim of misfortune, imperfection, but not evil. When nature deprives us of water or of anything else we need to live, it does so without intention. There is neither benevolence nor malevolence in nature, there is merely process. Imperfection is in the nature of things: sometimes it rains too much and sometimes not enough, but evil is specifically the result of human intention. Were it the case that through adaptation we can become perfect, evil would be impossible for we would be incapable of action. Were there such a thing as social evolution, a process dictated by necessity which drove us onwards to the perfect society, it would be impossible for us to act. Action is possible only because we are not locked into necessity, because we have the freedom to choose and it is this possibility of choice which makes good and evil possible. This being so, it is equally true that evil is not evanescent but permanent. We can never arrive at a form of society in which choice is no longer necessary because the social conditions themselves dictate good behaviour. This is not to say that social conditions have no influence on behaviour. On the contrary, a woman who is beaten by her husband is likely to be miserable, resentful, afraid, unconfident and may resort to murder. But the poor social condition of wife-beating does not arrive out of nowhere: it is an action, a choice made by the husband. All social conditions are brought about by human choice and action. The existence of poverty among plenty, for example, is not the outcome of the working of an abstract economic law, it is a result of selfishness, for there is no law anywhere in the universe which says that the rich cannot give up some of their wealth for the benefit of the poor. Social conditions can assist good behaviour only if good actions engender social conditions. Spencer's belief that conditions will somehow automatically come good is a denial of human history for this is not an evolutionary process in which each stage follows the next in a stately progression from lower to higher. It is the story of human choices, some wise, some foolish, some good, some evil and that is why regression is, at every moment of human life, just as possible as progress. For Spencer, because he does not understand the limits of necessity and the bases of freedom, progress must be either a necessity or an accident. In either case, it is not an intention. Unintentional progress, whether by accident or necessity, can have no moral value for such value is attributable only to intentional actions. If progress is a necessity then it is morally worthless, however great its value economically or technologically. Now, when Spencer speaks of progress, he is thinking of moral improvement. The perfectibility of human life in which he believes is an essentially moral concept: once constitution and conditions are in harmony then we shall see the full blossom of human potential in which the freedom of each shall be the freedom of all. Freedom is not a scientific but a moral concept. The outcome of the working of necessity cannot be freedom, for the realm of necessity is value-free. Freedom must be the outcome of intention, choice and action. Progress, other than merely technological progress, the progress of systems, must be the result of action too. If progress is progress towards freedom then neither necessity nor accident can lead us to it. Freedom is something we must choose. In spite of this, however, it is also true that we are condemned to be free. We do not have the choice not to choose. Other species do not have the choice to choose. A spider spins its web as nature, or instinct, dictates. It cannot innovate. It cannot choose to do it any other way. It cannot act and therefore its behaviour is neither good nor evil. We, on the other hand, cannot but choose for nature does not dictate our behaviour except at the most fundamental biological level. We must breathe, eat and sleep but even then we can choose to eat much or little, fat or lean and we can sleep more or less according to our choice. Beyond this basic level is the sphere of action where we choose between one possibility or another and because we choose, our actions are subject to moral judgement. Our freedom, then, is a product of necessity but we are free only because in action necessity is surpassed. Our freedom is something we must choose in the sense that only when we accept full responsibility for our own actions can we be said to be free. If we believe that we act out of necessity, that law dictates that we must act in certain ways, that for example, the "law" of maximisation of profit dictates that I must pay my employees poor wages, we are deluded. Action and necessity are mutually exclusive. To act out of necessity is impossible. Action is choice. Necessity eliminates action. Yet though we are condemned to be free, to choose, to act, if we deny-the truth of this to ourselves then we live as though the opposite were true. We pretend that our actions are mere behaviour. We refuse responsibility for then we blame "the market" or "history" or "circumstance". This is what Shakespeare, in King Lear, calls "a worthy evasion of whore-master man". The market, history and social circumstance are all the outcomes of choices we have made and actions we have performed. We are free even when we pretend that we are not. When we accept our freedom, however, and the responsibility which goes with it, then we have a hope of attaining that freedom in which Spencer believes where everyone has the fullest possibility for the exercise of their faculties so long as they respect fully the right of others to exercise theirs. The paradox of Spencer's faith in necessity is that if it were right then the freedom he so wishes would be impossible. If morality is, as Spencer puts it, "a species of transcendental physiology", if it is governed by the same necessity as the circulation of the blood, then there is no choice, no intention, no action, no freedom, no progress. The absurdity of this is that we would have to conclude that Spencer's work itself is the product of necessity, that there is no intention, no choice, no action behind it. In this case, all the moral import of Social Statics would evaporate. Spencer's defence of democracy, his arguments for the rights of women, his sponsorship of the individual, against the power of the State, all this would be meaningless if it did not amount to a moral view of the world. If necessity dictates, for example, that women shall be equal to men, whence the outrage at their degradation, for if this is not the outcome of choice, even of choice made in ignorance, there is no basis for its moral condemnation. If necessity decreed that women should be treated as inferior for millennia, then we can only accept their subordination as a fact, in which case how does the moral outrage arise which can form the basis of a campaign for change? Such is the disjuncture between the obviously moral positions Spencer adopts and his failed attempt to elaborate a coherent theory of necessary progress to perfection. His moral assertions are influenced by his religious convictions and religion deals, of course, not in facts but in values. It is because Spencer tries to reduce values to facts, because he seeks to escape from the painful truth that as we are able to choose good so we are able to choose evil, and that, therefore, perfection is impossible and evil a perpetual possibility, into the reassuring certainty of steady, inexorable improvement, that he undermines his own potential as a moral philosopher. His tragic error is powerful evidence that the perfection in which he put his faith was thoroughly illusory.